Premium Black never goes out of style. For the most stunning and luxurious Business Cards available, look no further than our Premium Black Collection. Create the ultimate stylish networking card by combining the richness of the black stocks with Foil printing. Ideal for any business looking to make an instant impression of quality and sophistication. Our Premium Black Collection includes four unique stocks, each with their own characteristics. The versatile 16pt Jet Black has a natural uncoated feel, while the 18pt Black Suede has a distinctive silky-smooth texture with Spot Black printing capabilities. The two most premium thicknesses are the 24pt Smooth Suede and our impressive 30pt Onyx, both highly durable and sturdy options. Stylish and sophisticated, the quality of Premium Black business cards will leave you in awe. The 24pt Smooth Suede offers a tactile suede-like texture and is complimented elegantly with a simple application of gold foil. This classic combination offers unparalleled luxury. Match the luxury of your Gift Card or Voucher with exquisite Premium Black Gift Card Holders. Choose between custom Screen Print or rich Foil printing to add your unique design and branding. Our Premium Black stocks offer a level of style and sophistication which is unrivalled. Match the luxury of your Gift Card or Voucher with exquisite Premium Black Gift Card Holders. Can I have color printing on Premium Black? 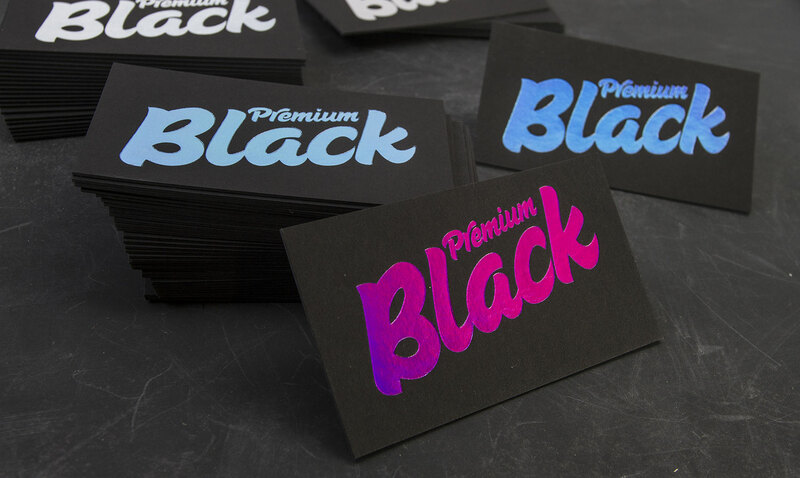 If you choose Premium Black W1S cards, the white is available with full color CMYK. We do not print ink on our Premium Black stocks as it will not show. The only way to add detail to the cards is with a foil, screen print or an emboss. Can Black Suede with Spot Black be used for custom shapes and sizes? request. You may also request this stock for larger sized products like flyers. Our unique 18pt Black Suede with Spot Black can be ordered in custom sizes such as European business card size, square shape or with rounded corners via submission of a Print Quote request. You may also request this stock for larger sized products like flyers. Can I add Spot UV to my Premium Black cards? If you'd like a Premium Black stock but want a similar appearance to spot UV, choose a clear or black foil. For a more cost effective alternative, opt for our 18pt Suede stock with Spot Black ink, though this option is only available on one side. You will have to go with a different print process on the other. Spot UV is only available on our 16pt Coated stock (which is a white stock) with Smooth Matte Laminate or Semi Gloss coating. How are Premium Black cards different from your other cards? As our Premium Black stocks are very dark, standard ink will not be visible when printed. Foil, Screen Print and Emboss are the only printing processes available on our Premium Black stocks. Our Premium Black cards are a premium product due to the high quality and caliber of card that is used – as well as the higher production costs from foiling / embossing (rather than printing). Our Premium Black cards are produced on an all-black card stock, so the the edges are black and the inside of the card is black (if you tear it apart). This is unique as most standard cards are white and printed with black ink to appear black. How eco-friendly is the Premium Black range? Please note: 2-Ply cards or cards with foiling or cannot be recycled with regular card/paper. The Premium Black range has been developed keeping sustainability and the environment in mind. All of the card stocks contain a minimum of 30% recycled content. Our 16pt Jet Black paper is acid free, lignin free, and made of 30% post consumer waste. It has an intense black colour and has a creamy texture that is smooth to the touch. Being acid free and lignin free means this paper stock will never lose its crispness and its fibers will not weaken overtime. Our 24pt smooth suede paper is made of 20% post consumer waste and an additional 40% is recycled fiber from other sources. Its unparalleled thickness and smooth suede-like texture make it our most luxurious card stock. A distinct malleable feel paired with its unique surface texture will have people convinced this stock is made of exquisite suede. Our 30pt Onyx Black paper combines extreme thickness with a super smooth surface. This is arguably one of our sturdiest paper stocks, sure to make a powerful impression. This exciting new addition to the Premium Black product line is currently available to order through a Print Quote request, and can be used in combination with foiling, letterpress, embossing and 3D embossing. Which black card stock is most water resistant? As these card stocks are all uncoated they are not resistant to water. page. Alternatively, you can pick up samples at any of our offices. Yes, Premium Black samples can be ordered through a Specialty Sample Pack from our Sample Pack Request page. Alternatively, you can pick up samples at any of our offices. Designs will be produced in Spot Black only (no other colors are available on this stock). Design needs to be submitted in pure black (100K). Details can be as fine as 0.125pt line weight; however, we recommend to make important details (such as text) larger to ensure legibility. Artwork can be full bleed.